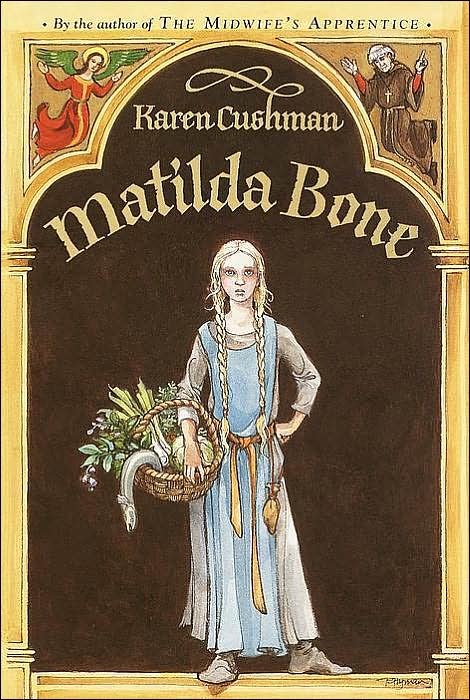 When Father Leufredus leaves Matilda at the shop of Peg the Bonesetter in Blood and Bone Alley, Matilda can hardly believe what is happening to her. Why is she, a literate God-fearing girl, being given the task of assisting a bonesetter when she should be spending her time doing something more enriching and useful. Matilda is appalled when she meets Peg and finds out what she is going to have to do for her new mistress. Why, she is going to have to sweep floors, make fires, and cook food, tasks that servants did in her old home. There is no doubt that this is a dreadful mistake. Surely Father Leufredus will come and rescue her from this place soon. As the days go by, and in spite of reluctance , Matilda begins to learn the bonesetter's craft from Peg. Peg herself is a generous big-hearted woman who does her best to teach Matilda and to open the girls eyes to what happens in the real world around her. What Matilda sees is that there is much suffering in the everyday world, and that there is much that she can do to help, besides offering up prayers to the saints that is. Is it possible she begins to wonder, that Father Leufredus’s world is not in fact the real one and that the world of Peg and her friends is what life is really all about? This beautifully written and though provoking book takes us on a remarkable journey of self discovery. Matilda learns that she cannot judge people by how they look, by how many books they have read, or even by how they relate to God. Instead, she must see them through the things that they do for others and by watching how they help those less fortunate than themselves.